Minol has a busy March in Michigan! We hope to see you at one or both tradeshows. This entry was posted in Uncategorized on February 19, 2018 by Minol USA. Addison, TX – June 24, 2015 – Minol announced the release of the Minomess 130 polymer water meter today at the National Apartment Association’s Annual Conference. The Minomess, specifically designed for multifamily and commercial usage, provides owners and managers with a cost-effective solution for managing their utility expenses. In the past decade, U.S. cities have seen a trend toward higher water bills. A few of the driving factors are excessive consumption, increasing water costs, decaying infrastructures and droughts. According to a recent Circle of Blue survey, the price of residential water service in 2015 is u p 6 percent in 30 major U.S. cities; a 41 percent rise since 2010. With utilities accounting for 15% or more of an owners’ overall expense, submetering has become a necessity in sustaining positive cash flow throughout the portfolio. Three states, Texas, Georgia and California, require submetering on new construction with more states likely to follow suit. The Minomess polymer meter is a single-jet meter for cold water applications. The polymer meter body provides a lighter weight and more cost-effective submetering option. The Minomess polymer and Minomess brass for hot or cold water application are both ANSI/NSF 61 certified and comply with AWWA C712, ISO 4064 and G13IT19001-ISO9000 performance standards. Minol’s in-house Meter Data Management Team successfully maintains 1.5 million hardware components nationwide by proactively managing daily meter health for water, gas and electric systems. Traditional AMR systems are designed just for meter reads. Minol’s MDM solution provides two-way data to insure accurate data which results in accurate billing. 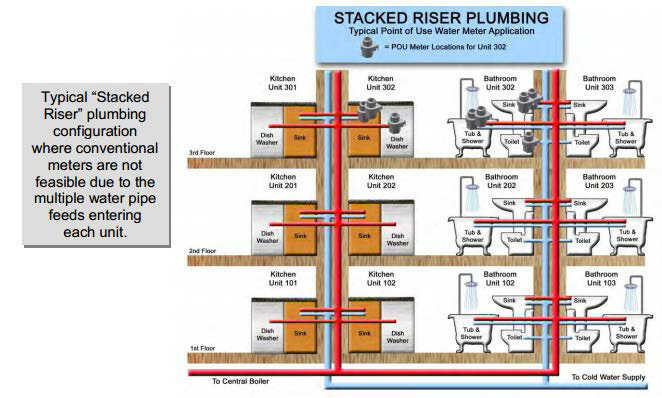 This entry was posted in Uncategorized and tagged apartment meters, Corey Hauser, cost-effective meters, Minol, Minomess, multifamily meters, NAA, poly water meter, utility expense management, water submetering, water submeters on June 24, 2015 by Minol USA.